Congratulations to all of you chosen for the 2018 Hardrock Hundred Endurance Run! This article breaks down the results of today’s lottery for the run’s 2018 edition. Let’s start with some statistics and background information. This year’s lottery entrants list was up to 2,236 applicants. For perspective, the 2017 lottery had 1,966 entrants, the 2016 lottery 1,549 entrants, and the 2015 lottery 1,367 applicants. These 2,236 entrants were represented by 12,357 total tickets, which went into today’s lottery buckets. For perspective, last year’s total ticket pool was 8,490 tickets. For the 2018 lottery, there were 43 Veteran applicants who had 422 tickets, 1,975 Never applicants with 11,127 tickets, and 218 Else applicants with 808 tickets. Looking back at last year’s lottery, there were 43 Veteran applicants who had 404 tickets, 1,722 Never applicants with 7,339 tickets, and 201 Else applicants with 747 tickets. The 2018 event will start 145 runners. Today, the event organization selected 33 Veterans, 45 Nevers, and 67 Elses. Of the 145 entrants chosen, up to five were chosen ahead of time by the race by Run Director Dale Garland, which were announced publicly among the names chosen in the lottery. In addition to entrants drawn in the lottery, waitlist names were also drawn into three separate division-specific waitlists. For perspective, in 2017, 10 people got off the Veteran waitlist and into the race (which was everyone on the Veteran waitlist),9 people from the Never waitlist, and 6 people from the Else waitlist. For the 2016 edition, the waitlists eventually yielded entrant spots 4 deep in the Veteran division, 4 deep in the Never division, and 7 deep in the Else division. For the 2015 edition, the waitlist went to 9 deep for the Veterans (which included all of the Veterans on the waitlist that year), 9 deep for Never, and 12 deep for Else. Even though this event is called a run and not a race, the front end continues to grow in competitive nature while still seeming to maintain the cooperative family spirit which Hardrock prides itself upon. Below we document the men and women who were selected in the lottery today who we think will be the main 2018 contenders. We also mention who is on a waitlist and might get in and who is on a waitlist so far down they probably won’t get in. Let’s start with the men’s competition. Kilian Jornet won last year’s race–with a dislocated shoulder–and he’s elected to use his automatic entry. Mike Foote and Xavier Thévenard are the two runners with certain entry who are more most likely to challenge Kilian, while Pau Capell who sits second on the Never waitlist could spice up the front of the field when he almost certainly gets in. The 2017 women’s champion, Caroline Chaverot, had the option of automatic entry, but declined to return for 2018. However, Switzerland’s Andrea Huser got in and that means trouble for everyone else in the women’s field. Kaori Niwa of Japan, who finished fourth at UTMB in 2017, is Huser’s strongest challenger. If Nikki Kimball can return to her form of old, she’ll certainly be up front, while perennial podium contender Darla Askew will again be in the mix. Big movement atop of the waitlists could greatly enhance the depth of the women’s fields with 2015 and 2016 champ Anna Frost ninth on the Else waitlist; 2013, 2014, and 2015 champ Darcy Piceu ninth on the Veteran waitlist; Bethany Lewis, who finished third in 2016, eighth on the Else waitlist; and 2017 Western States 100 third place and Hardrock newcomer Sabrina Stanley is now in the race after starting as fifth Never waitlist. Below is the full list of who was chosen in the lottery, and on the various waitlists. Let’s get on with the lists of top competitors who are in, who may be, and who is definitely not. You can see the full entrants list here or look back at the lottery play-by-play on the Hardrock 100 Twitter feed. There is only one way to gain auto entry into Hardrock, and that is by winning the prior year’s race. Kilian Jornet has chosen to use his entry to go for his fifth-straight win. Here are the front-end men’s contenders who were chosen in the top-10 slots of the Veteran waitlist, the top-15 slots of the Never waitlist, or the top-20 slots of the Everyone Else waitlist. These men have some shot of getting off their respective waitlists and into the run. Here are the female contenders who were chosen in either the top-10 slots of the Veteran waitlist, the top-15 slots of the Never waitlist, or the top-20 slots of the Everyone Else waitlist. These women have some shot of running. Who are you most excited about running the 2018 Hardrock 100? I think you got John Fegyveresi mixed with John Kelly. Fegyveresi is 2012 winner, Kelly 2017. Thanks for catching that. Also had John Kelly on my mind since he was also drawn, but on the waitlist. You neglected to note that Irunfar’s Bryon Powell was selected to once again participate in the run! Very exited for all those selected and encourage those who didn’t get picked to continue to dream. Shoot. How’d I miss that name?! The Else lottery also includes those who have started Hardrock, but have not recorded a finish. Thanks for the note. We tweaked the language for the Else category. I was under the impression that Francoise D’Haene and Jim Walmsley were going to enter for 2018? So far it seems to be relatively dull for both men’s and women’s races. François D’haene was in the Never lottery pool with two tickets, meaning he only had a 0.9% chance to get in. Jim Walmsley decided not to enter the UTMB lottery for this year. Do you mean Walmsley decided not to enter the Hardrock lottery? Yes. Walmsley decided not to enter the lottery. That is so hard to understand — unless he’s already decided to give up on the 100 distance. Why is that hard to understand? He’s running Western States–a nut he’d still very much like to crack–and, I’d guess, UTMB… although I could be wrong on the latter. It’s hard to understand why he wouldn’t want to start the lottery ticket count. The odds of being picked are so low for him now that he would likely not have had to give up on UTMB or WS. Jim has been volunteering yearly and building tickets for Hardrock since 2015 but is planning to race Western/UTMB again. Also he was asked by the Hardrock board to witness and pull tickets at the Hardrock lottery this year, which he considered as an honor, but doing so disqualifies you from entering yourself into the lottery. It’s a little off to the side, but his name is also on the AC 100 list for early next Aug.
Maybe wants a crack at Ol’ Jim’s time? Don’t forget Jeff Rome who was 7th male at Hardrock this year! Duly noted. Thanks for the reminder! Just wondering who the five “chosen” were. I do not find it listed anywhere. The five race entries are not disclosed. Xavier was in the “Else” lottery with an 18.3% chance of being drawn. Good point, thanks Bryon. The other 3 could be still be considered suspicious though, right? We could probably get a stats person to do a hypothesis test to give us a 99% significance level that they are selected picks. I’m not sure I’d label any “suspicious.” The race reserves the right to pick five runners, the identity of which they don’t disclose. I, for one, would love if the race were picking two prominent female trail runners from the Never grop in Andrea and Kaori to join the race. 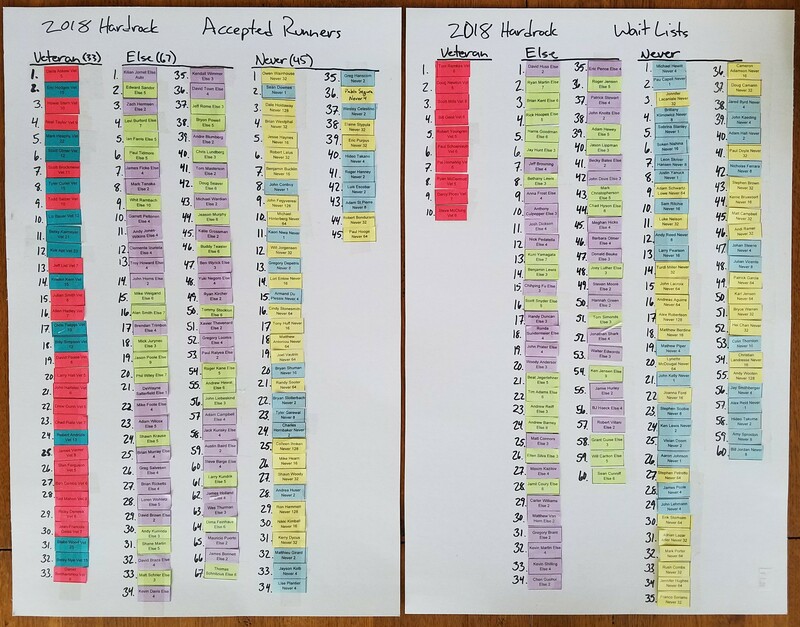 To think, running next year’s HR100 qualifier….all are tough, mountainous, 100 mile races….will gain me an additional 0.2% chance of getting selected in the Never pool (4 tix to 8 tix or 1.7% to 1.9%). It’s less about “kissing the Rock” than it is “tilting at the Rock”…. Don’t forget about Ryan Kaiser! I don’t see him on the entrants list or the waitlists… where do you see he’s in? With the exception of Andrea Huser, this looks the same field that’s ran it for the last five years. “Run” does seem more appropriate than “race”. Yeah, that’s disappointing. Only good thing is at stome point they might succeed in making the race so dull that it’s going to be easier to get in. Bryon- do you know how deep the wait lists went last year? I think it’s been 9, 4, and 9 deep off the waitlist for the past three years… so your odds aren’t good… but not impossible. She’s not, as already noted in the main list of runners. We’ll update the intro. Thanks!